Some body parts need to be conveniently removable. In some installations, the nose must be removed to service the radiator, and in nearly all installations, the scuttle must be removed for electrical and instrument service. Dzus quarter-turn fasteners are a strong and secure way to mount body parts, and have a long history in aviation and auto racing. 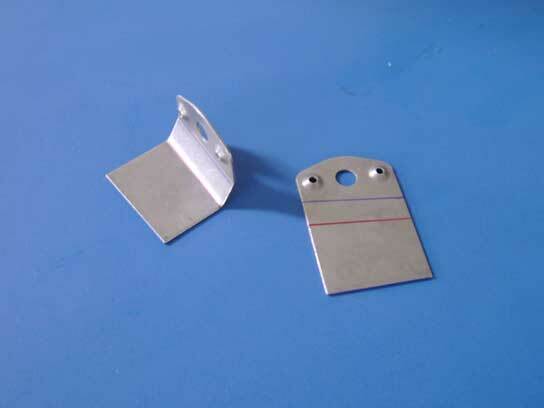 And so we offer a "Dzus kit" suitable for mounting one nose or scuttle per kit. Here's a quick primer on how to use them, using a scuttle as our model. The Dzus system has two main components; a spiral-cam stud (often called a "button") and a receptacle containing a wire form spring. The receptacle is mounted on the base structure and the stud goes through a hole in the body panel, with its head on the outside of the panel and its spiral locked into the spring. Dzus fasteners come in a variety of sizes, but the size best suted to our application is the 6.5, which has a 13/64" diameter stud, and that's size we stock. 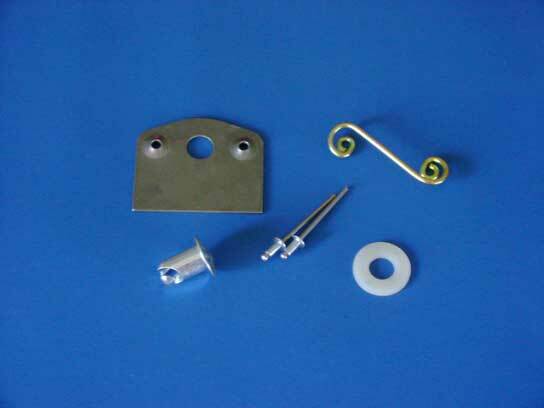 Our Dzus kit includes four receptacles ("plates"), four springs, and four studs ("buttons"). For a homebuilder, it is easiest to attach the spring to the receptacle with a pair of 1/8" diameter button-head blind rivets. 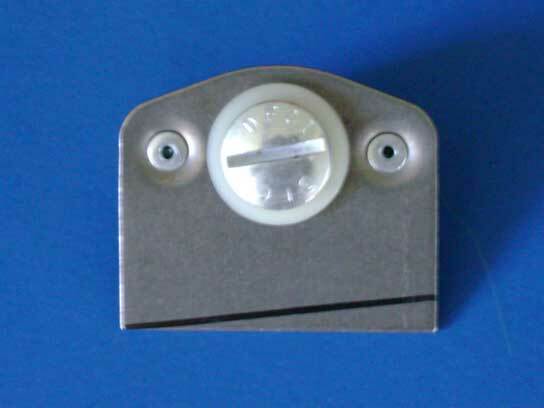 The receptacle is deeply dimpled for rivets, sufficiently so that countersunk rivets are not required for a flush fit. Leave one receptacle without a spring for the moment. Here a stud (with a 3/8" plastic washer as a retainer) has been inserted into a receptacle and turned 1/4 turn clockwise to secure it in place. 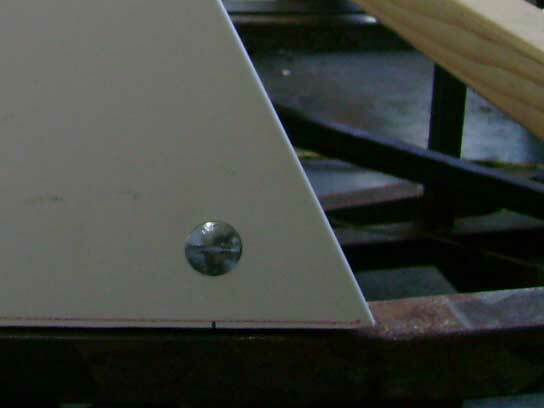 This next step is completely optional, but it drives me crazy when Dzus fasteners are installed crooked. I want all mine with the slot horizontal when they're locked in place, so I can tell at a glance if I've left one unsecured or failed to give it the full quarter turn. Apparently it doesn't bother the manufacturer, because to get the slot to sit horizontal, the spring has to be cocked a bit in the receptacle, and the receptacles are made with the spring mounting holes level, not the stud. So I trim the bottom of the receptacles to compensate; I eyeball the first one, cut or grind to the line, and mark the other ones to match the first one. Using the unsprung receptacle as a guide, place it in position on the inside of the body part (the scuttle in this demo) and trace the center hole onto the part with a felt pen. 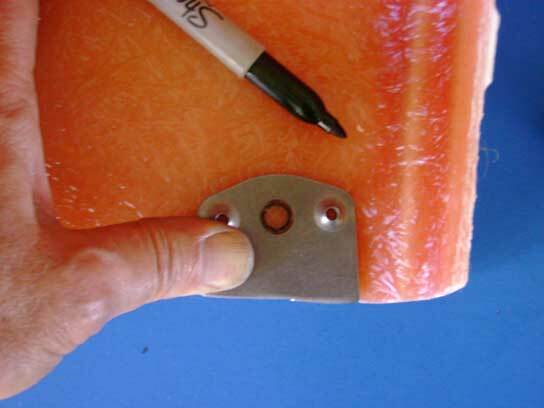 If you use a dark felt pen (black, for example) and have a light colored fiberglass part (white, for example) and a strong source of illumination (the sun, for example) you can see the traced ring through the part and mark the center of it on the outside of the part. Doing so may make drilling easier. Trace the center holes of four receptacles, widely spaced apart, and drill the holes to 13/32". Step drills seem to be the easiest for the drilling task, Harbour Freight has an inexpensive set of three, and one of them has a 13/32" step. 3/8" won't work, and 7/16" is a bit loose for a scuttle (in my opinion) or anything else that will be removed rarely, but for your hood/bonnet you may well prefer 7/16"..
Test fit the parts. Push the stud into the hole in the scuttle from the outside, push the retainer washer (not visible here) onto the stud from the inside, fit the receptacle over the stud with the spiral-cam portion of the stud fitting onto the spring portion of the receptacle, and give the stud a quarter turn, using a large screwdriver, small coin, or even an authentic Dzus tool. This will hold the parts tightly together. Turn them so the base of the receptacle is properly positioned to weld to the chassis, and do the same with the other three sets of parts. This is your opportunity to get the fit just right. You may need to grind the receptacle bases a bit, or sand the scuttle a bit, for an optimally attractive installation. In the case shown, we have to do a little of both. Once you have the receptacles shaped and positioned just the way you want them, you can QUICKLY AND CAREFULLY tack weld them in place. 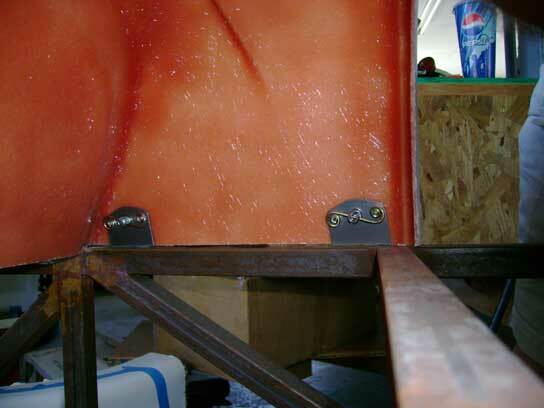 The retainer washers hold the fiberglass away from the receptacles, and you can do a quick little spot with a wire-feed welder without heating the fiberglass appreciably. Do one corner, move on to another receptacle, and after the first one has cooled, tack the other corner. Then give all the studs a quarter turn clockwise and remove the scuttle..
With the scuttle removed, finish weld the receptacles to the chassis. Only weld them on the back, or you'll have to grind the fiberglass away to fit over the weld bead in the front. I'm showing you this side because you really don't want to see the back. If you've seen my Mallard Injected Guano photo, you know what my welds look like. The above instructions were posted a year ago, here's what we've learned since then. Spring adjustment: depending on the thickness of the material you're Dzusing, your springs are likely to be too "tall" and turning the stud to lock will be difficult, or even impossible. If so, you'll want to scrunch them flatter. In the photo above, the spring on the left is full height, and the spring on the right has been scrunched. There are many ways to compress the springs, from thwacking them with a hammer to pressing them with a C-clamp. The easiest way to scrunch both sides evenly is to put them in the jaws of a bench vise and crank it down. 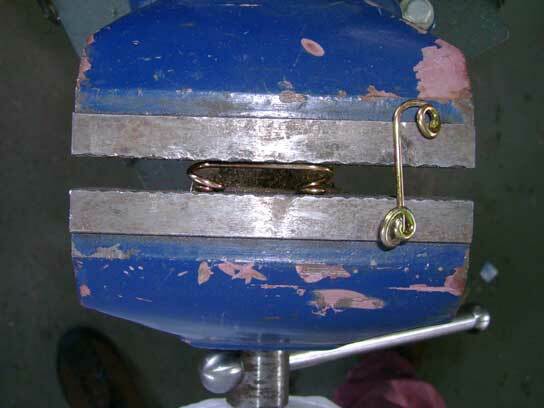 The photo above shows a spring being scrunched by itself, but all these techniques can be used after the spring is riveted to the plate. 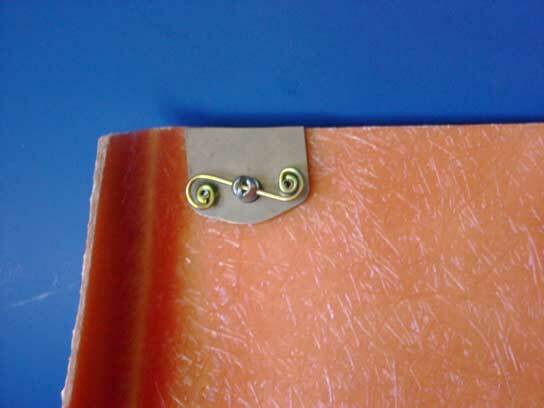 I prefer to test fit the springs before riveting; they can be held in position on the plate and the stud twisted and locked before riveting, but you can rivet first if that's more convenient for you. Try not to overscrunch, since it's hard to stretch the springs out again, though if you have to, you can pry the coils open a bit with a flat screwdiver. Also, I find it easier, both to affix the plates to the chassis and to install the part afterward, to bend the plate so the base of the plate stands off a tad from the fiberglass. As you see above, we now have extra tall plates available. You can cut them off (at the red line) as usual or leave them long. Either way, by bending it out a bit (at the blue line) you can space the base away from the part you're attaching, without having to use a spacer (such as the nylon washer that comes with our Dzus kit). 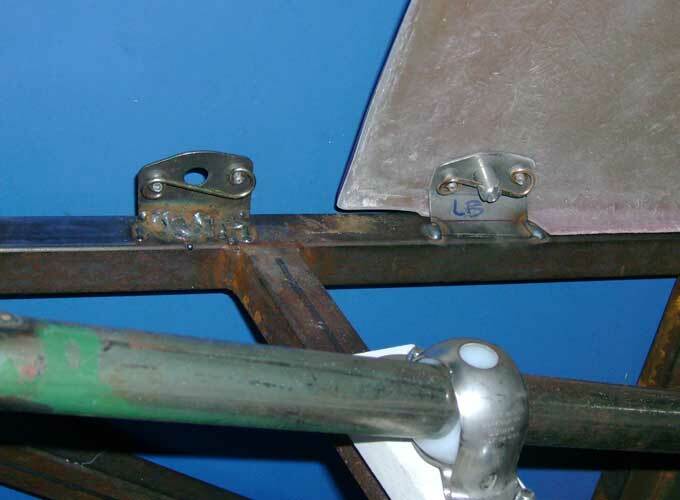 A bit of space is necessary, if you're mounting a fiberglass part so you don't burn the part when tack-welding the plate to the chassis, or if it's a steel part, so you don't weld the part to the chassis along with the plate. There's no particular bend dimension you have to meet, 1/8" will do the job. Use a pan brake or press brake if you have one, but the traditional (What Would Fred Flintstone Do?) technique of clamping it in a bench vise with the bend line at the top of the vise, placing a piece of wood against the upper part of the plate, and whapping the wood with a hammer, will do just fine. If you like (and I'm sold on it myself) you can leave the plate long and put two bends in it, so the base can be clamped to the chassis before welding. If you clamp it securely, you can remove the part before tacking, which in some circumstances may make it easier to see what you're doing. You can do test fittings before warming up the welder, and cut the base to length before you weld, or tack the full length base in place and cut off the overhang with an angle grinder and cutoff wheel. This photo was taken with the camera resting on the shift knob and shooting over the steering shaft, showing the inside rear of the hood/bonnet/engine cozy. The scuttle has been removed so I could take the picture; the plate on the left side of the photo is the front scuttle mount. 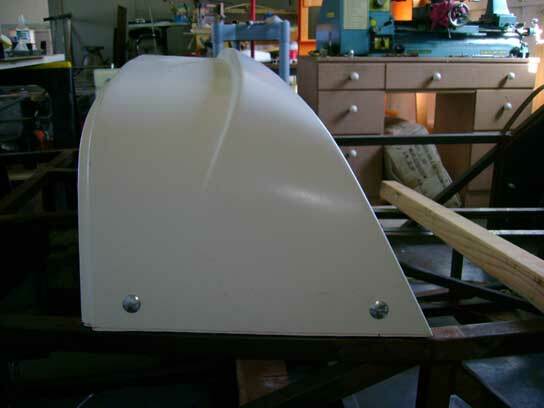 and the hood is mounted on a double-bent plate. I hadn't noticed it before looking at this photo, but the hood mount plate was sure welded better than the scuttle mount plate. The scuttle mount plate is the one I mentioned earlier as "I'm showing you this side because you really don't want to see the back" but there it is. 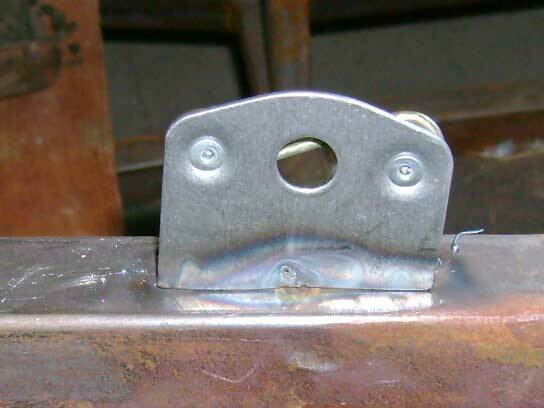 Two things are responsible for the difference in weld quality. First is, the scuttle was mounted a year ago and I've had some "stick time" since then. Second is--and this makes a huge difference--I got some top-quality equipment in that year. I'm now using a Millermatic 180 MIG welder with Auto-Set, so I'm getting the current and wire speed right (I love it; instead of looking at charts and twirling two knobs while running test beads on scrap, I turn the Auto Set to 16 gauge and get to work) and all the drive components are metal so the wire doesn't come out in jerks, and I got a Miller Elite auto darkening helmet to replace the less-expensive-and-worth-it auto darkening helmet I'd used before. If you're thinking, "Oh come now, what's the difference between a $400 helmet and a $79 helmet, they both go dark when it sparks," the difference is hard to explain, but easy to see (see photo above, YMMV but it works for me). At this rate, I may be able to retire my welding duck. You may want to use aluminum pop rivets to do your fitting, then drill them out and remove the springs when painting your frame, then reinstall the springs with steel (or stainless steel) rivets. If you do, and you've done custom spring scrunching, mark your springs (painter's tape is good) or you'll mix them up and have to rescrunch. Guess how I know this?